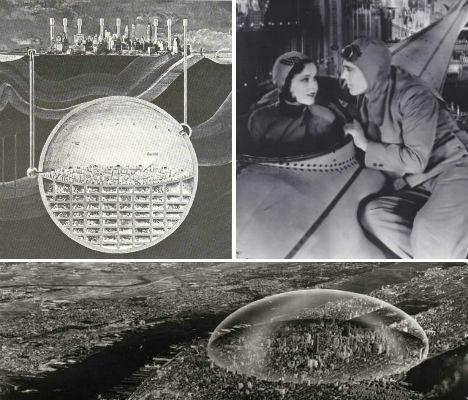 What would New York have looked like, if the futuristic visions of innovative thinkers in the late-19th to mid-20th century had become reality? 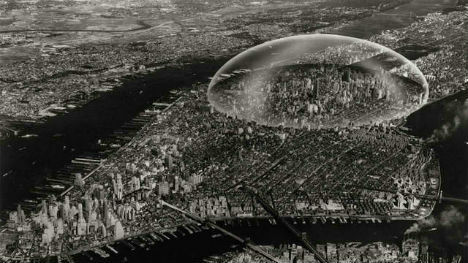 Midtown Manhattan could have been enclosed within a dome, as imagined by Buckminster Fuller. The Hudson River could have an enormous bridge with towers that reach hundreds of feet into the air. And of course there’s personal aircraft involved. Here are some of the most outrageous and intriguing of these predictions. 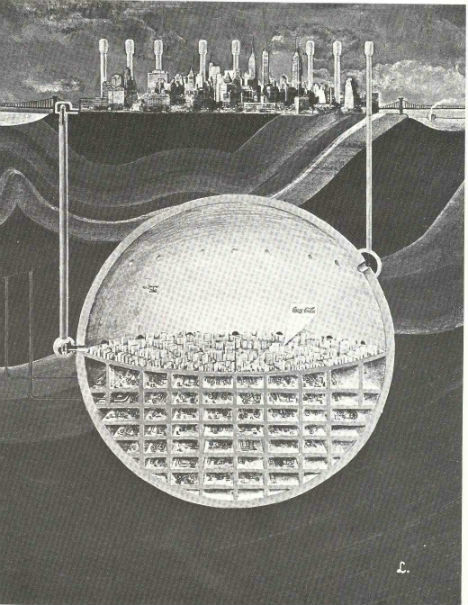 During the height of Cold War fears over nuclear attacks, Oscar Newman dreamed up this wacky design for a nuke-proof second New York City, to be located in a hollowed-out space hundreds of feet below the existing city. Published in 1969, this highly impractical vision ironically called for nuclear weapons to be buried deep underground and detonated to create the space. 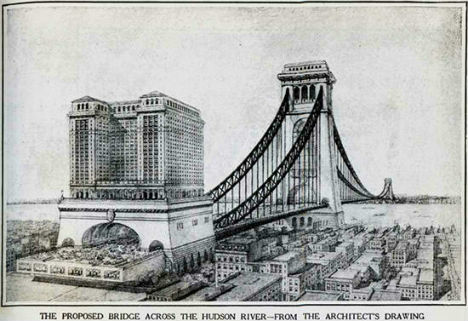 Gustav Lindenthal’s design for a colossal bridge across the Hudson River would have included towers that are taller than the Woolworth building (which remains New York’s tallest skyscraper.) The bridge, for which a cornerstone was built and still exists, would have been 6,000 feet long, 200 feet wide and 200 feet above the river with 12 railroads, 24 traffic lanes and 2 pedestrian promenades. 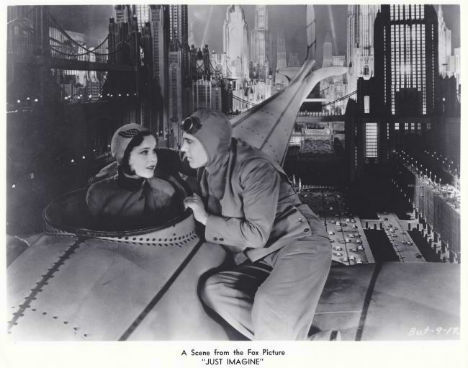 In the 1930 film ‘Just Imagine‘, Depression-era aesthetics crash into wild fantasies of New York in 1980, with massive 16-lane highways, vertical architecture full of terraces and lots of inexplicable ‘high-tech’ equipment. Cartoonist W.A. Rogers’s depiction of an elevated railway system running amok in Manhattan seems to have been a satirical commentary on expansion and development in the New York City of 1887. 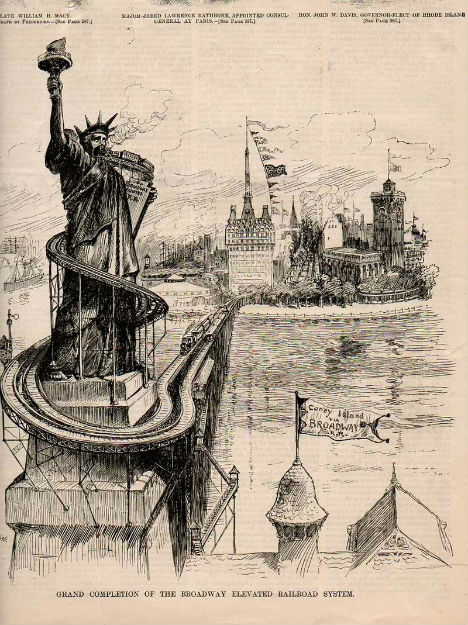 The cartoon shows a railway winding up the Statue of Liberty and entering the frightened-looking lady’s mouth.